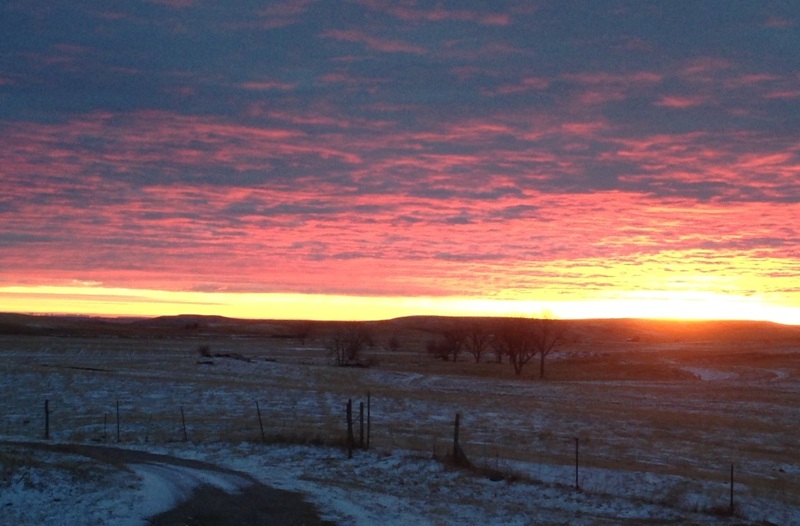 Sunrise at Windbreak House, February 5, 2015. Sunrise this morning began while I was sitting in bed writing in my journal—just a long stripe of light blue beneath a shield of heavy black, like a crack opening into another universe. I’d let the dogs out and logged into email to find a tangle of conflicting, angry messages from members of a group of which I am a member. Glancing through them sent my stomach roiling, so I shut down and climbed back into bed with today’s book. The book, while it means well, concerns recovery from stroke, so while its message is upbeat, the general topic did not especially cheer me. So I put it aside and pulled my journal out from under my pillow—I like to keep it handy for late-night inspiration–determined to write something positive to offset the email clamor I’d have to face later. As the light grew with the earth’s slow rotation, I realized that this was going to be one of our especially gorgeous sunrise experiences. What looked like a flat, heavy layer of black clouds began to ripple as the light strengthened, the clouds heaving and shifting in shades of gold and peach. Swells of light like the ocean’s waves rolled across the prairie’s beach. Below the clouds, the air was still at twenty degrees or so, the grass still dusted with snow. But the light promised that the day would improve. As Jerry took the photograph, I realized that the very best sunrises are those with clouds in them. When the sky is clear, the sun’s light simply flows like honey over a table, golden and lovely–but flat. Clouds ripple and heave and turn from black to blue. Clouds churn and lunge and wrap around each other. Their darkness should encourage us to appreciate sun’s light and warmth. The metaphor was so obvious I laughed out loud, startling the dogs out of their post-awakening, pre-breakfast nap. When everything in our lives is streaming along as smoothly as a river in spring, we may not appreciate just how lucky we are. Clouds—murky, roiling , threatening—make us pay attention, and remind us that things could be considerably worse. That barbed-wire tangle of emails waiting to snag my attention made me appreciate the complications of sunrise. How fortunate I was to have this quiet time to read and write before the day’s concerns began to rise over the edge of the horizon. The troubles I encounter every day should remind me how fortunate I am for days when there are no complications, when my writing flows like honey. Today’s clouds encouraged me to appreciate the light around their edges. When I return to the computer, I’ll answer those emails as quickly as possible so as to get back to the day’s bright promise. Or perhaps I’ll put the emails off until sunset.